As Mueller is releasing memos on Paul Manafort and Michael Cohen, it’s important to understand how the investigation has progressed regarding another key person — Michael Flynn. This is a timeline, originally design by Reddit user u/Flynn_Timeline (with some additional sources and edits), detailing the important acts Flynn is currently being investigated (and pleaded guilty) for. April 2014 — Flynn is fired as director of the Defense Intelligence Agency (DIA) (“abusive with staff, didn’t listen, worked against policy, bad management, etc.” per Colin Powell). Summer 2015 — Flynn is paid by ACU Strategic Partners to travel to the Middle East to promote a trillion-dollar Saudi-financed U.S.–Russian business to develop nuclear power capabilities in the Arab world. Flynn does not disclose this trip when applying for his security clearance renewal in Jan. 2016. Late Summer 2015 — Flynn begins advising the Trump campaign. Aug. 2015 — Flynn receives a $15,000 speaking fee from Volga-Dnepr Airlines, a Russian airfreight company that the U.N. had suspended from its list of approved vendors, after a corruption scandal involving an indicted Russian U.N. official. Oct. 2015 — Flynn receives a $15,000 speaking fee from the subsidiary of a Russian company specializing in “uncovering Western government spyware,” Kaspersky Lab. Ruslan Stoyanov, head of Kaspersky’s computer incidents investigation unit, is later arrested in Russia, for treason, in December 2016. Flynn travels to Saudi Arabia to, again, promote the Saudi/Russian nuclear project. He fails to disclose the nature of the travel and reports a fictional hotel name as his residence during the trip. Dec. 2 — Flynn and his son meet with Russian ambassador Sergey Kislyak at his Washington, D.C. residence. In a subsequent email to the Russian embassy, Flynn’s son described the meeting as “very productive”. The meeting came to light publicly only in April 2018. 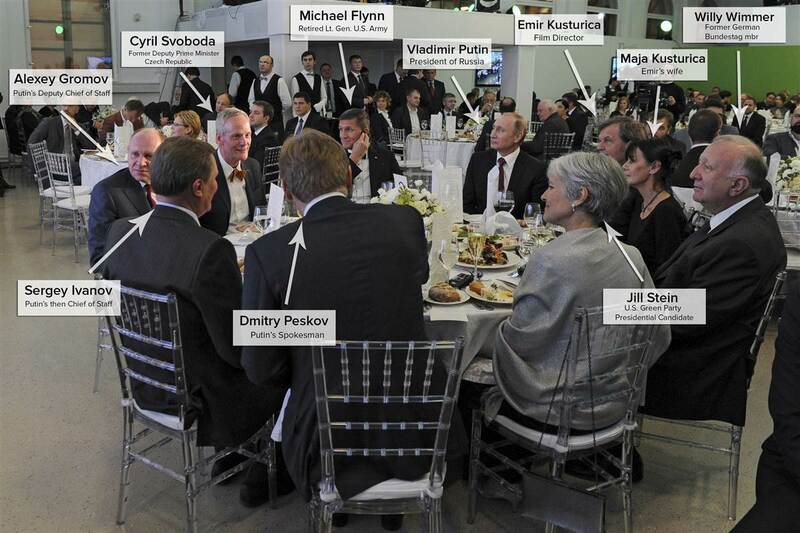 Dec. 10 —Seated directly at Vladimir Putin’s right hand, Flynn appears in Moscow at a gala hosted by Kremlin-controlled propaganda outlet Russia Today (RT). RT pays Flynn $45,000 for his participation and provides airfare, accommodations and other expenses for Flynn and his son. U.S. intelligence notices an uptick in communication between Flynn and Kislyak shortly after. Feb. 2016 — Flynn increases his role with the Trump campaign and is later vetted as a possible VP pick. Feb. 11 — While applying for renewal of his security clearance, Flynn tells Pentagon investigators that he had received no income from foreign companies and had only “insubstantial contact” with foreign nationals. May 2016 — Flynn joins the advisory board of OSY Technologies, part of the NSO Group, a secretive cyberweapons dealer founded by former Israeli intelligence officials. NSO’s spyware is subsequently found to have been used to attack and surveil prominent journalists and human rights activists. Aug. 9 — Flynn signs a contract with Inovo, a firm owned by Ekim Alptekin, a close ally and appointee of Turkey’s president, Recep Tayyip Erdogan. Flynn is assigned to run an influence campaign to discredit Fethullah Gulen, a Turkish cleric who lives in Pennsylvania and was blamed by Erdogan for a failed coup. Summer 2016 — Flynn Intel begins work on a pro-Turkey documentary, hiring professionals to shoot it, misleading them about the intentions of the project and working to conceal its role in producing the film. Aug. 17 — Flynn begins attending classified intelligence briefings with candidate Trump. Sept. 3 — Flynn and associates begin reaching out to Russian hackers in an attempt to obtain Clinton’s personal e-mails and transmit them to Flynn through an intermediary. Sept. 19 — Flynn meets with Turkey’s ministers of foreign affairs and energy, Erdogan’s son-in-law, and other officials at an undisclosed New York hotel, in a meeting arranged by Alptekin. Among other topics, Flynn discusses a plan for “a covert step in the dead of night to whisk [Gulen] away” without going through the legal extradition process. Sept. 20 — Flynn, his son, and business partners meet with Dana Rohrabacher, a U.S. congressman best known as a staunch advocate of pro-Russia policies. Nov. 8 — Election day. Flynn publishes a lengthy op-ed entitled “Our ally Turkey is in crisis and needs our support“. He states that “we need to see the world from Turkey’s perspective” and brands Gulen as “a radical Islamist”. Flynn does not disclose to the publisher that he was being paid by Alptekin. Nov. 10 — Obama, in a face-to-face conversation with Trump, warns against hiring Flynn to be part of Trump’s national security team. Nov. 11 — Media reports expose Flynn’s contract with Alptekin to lobby on behalf of Turkey. Nov. 18 — Flynn accepts Trump’s offer of the position of National Security Advisor. Pence receives a letter from Rep. Cummings notifying him of Flynn’s work on behalf of Turkey. Nov/Dec 2016 — Flynn meets with Austrian far-right leader Heinz-Christian Strache at Trump Tower. Strache announces weeks later that his party has signed a cooperation agreement with Vladimir Putin’s ruling party. Dec. 1 — Flynn meets with Russian ambassador, Kislyak, and Trump’s son-in-law, Jared Kushner, at Trump Tower. The men discuss the possibility of setting up a secret and secure communications channel between Trump’s transition team and the Kremlin, using Russian diplomatic facilities to shield their discussions from monitoring. This meeting comes to light in March 2017, after January White House claims that only texts and phone calls were ever exchanged. Kislyak later acknowledges that he and Flynn were in contact during the campaign. Mid-Dec — Flynn meets with the Turkish government to discuss an offer to pay him and his son as much as $15 million to kidnap Gulen and deliver him to a Turkish prison island. Dec. 29 — Flynn secretly discusses relief from U.S. sanctions with Kislyak on the same day the Obama administration announces its response to Russian interference in the campaign. Jan. 4, 2017 — Flynn tells Trump’s transition team that he is under federal investigation for secretly working as a paid lobbyist for Turkey during the campaign. Jan. 6 — The FBI begins investigating Flynn’s late December phone conversations with Kislyak. Jan. 12 — Conforming to the wishes of Turkey, Flynn instructs the Obama administration to hold off on a military operation to retake the Islamic State’s de facto capital of Raqqa with Syrian Kurdish forces. Jan. 18 — Flynn attends a “working breakfast” with the Foreign Minister of Turkey and others, including Devin Nunes, chairman of the House Intelligence Committee. Jan. 20 — Trump is inaugurated. Flynn becomes National Security Advisor. Jan. 22 — The WSJ reports that Flynn is under investigation by U.S. counterintelligence agents regarding his communications with Russian officials. Jan. 24 — The FBI interviews Flynn regarding his Russian contacts. Jan. 26 — Acting Attorney General, Sally Yates, informs the White House that Flynn misled the FBI in his interview, that the DOJ knew that Flynn’s public accounts were untrue, and expressed concerns that he was vulnerable to blackmail by Russian intelligence. Jan. 30 — Trump fires Yates. Feb. 13 — Flynn is forced out of his role as NSA after The Washington Post reports on Yates’s warning to the Trump White House. March 7 — Flynn files paperwork acknowledging that he worked as a foreign agent representing the interests of the Turkish government. March 22 — Trump asks Director of National Intelligence Coats to intervene with Comey to get the FBI to back off its focus on Flynn. April 11 — The Pentagon begins investigating undisclosed payments Flynn received from foreign governments. April/May — Federal prosecutors issue grand jury subpoenas to Flynn associates seeking “records, research, contracts, bank records, communications” relating to Flynn and Alptekin. May 9 — Trump fires Comey. May 22 — A House committee reveals that Flynn lied to Pentagon investigators about the source of money he received from RT in 2016. Flynn announces that he will not cooperate with a subpoena requiring him to hand over documents related to his dealings with Russians. June 2 — Special Counsel Mueller assumes control of a grand jury investigation into Flynn. August — Flynn files paperwork disclosing payments from SCL Group, a Virginia-based company related to Cambridge Analytica. Dec. 1 — Flynn pleads guilty to willfully and knowingly lying to the FBI about his December 2016 conversations with Kislyak.